Issue 1 v Bournemouth, 11/8/07. Issue 3 v Leicester City (Carling Cup 2), 28/8/07 - abandoned. - v Peterborough United (Johnstone's Paint Trophy 1), 4/9/07. Issue 4 v Leicester City (Carling Cup 2), 18/9/07. Issue 5 v Gillingham, 22/9/07. Issue 6 v Hartlepool United, 6/10/07. Issue 7 v Doncaster Rovers, 20/10/07. 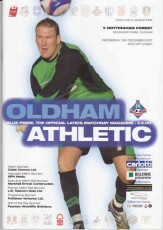 Issue 8 v Oldham Athletic, 30/10/07. Issue 9 v Tranmere Rovers, 3/11/07. 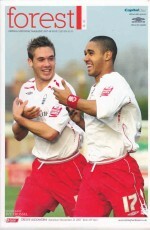 Issue 10 v Southend United, 6/11/07. Issue 11 v Crewe Alexandra, 24/11/07. Issue 12 v Lincoln City (FA Cup 1, replay), 27/11/07. Issue 13 v Northampton Town, 15/12/07. Issue 14 v Port Vale, 22/12/07. Issue 15 v Huddersfield Town, 1/1/08. Issue 16 v Leyton Orient, 12/1/08. Issue 17 v Swansea City, 29/1/08. 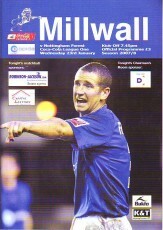 Issue 18 v Millwall, 9/2/08. 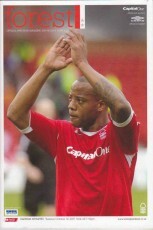 Issue 19 v Swindon Town, 16/2/08. Issue 20 v Carlisle United, 3/3/08. Issue 21 v Walsall, 15/3/08. Issue 22 v Brighton & Hove Albion, 24/3/08. Issue 23 v Cheltenham Town, 5/4/08. Issue 24 v Bristol Rovers, 8/4/08. Issue 25 v Luton Town, 19/4/08. Issue 26 v Yeovil Town, 3/5/08. (1) v Ilkeston Town (Pre-season friendly), 17/7/07. (2) v Rushden & Diamonds (Pre-season friendly), 18/7/07. (4) v Dunfermline (Pre-season friendly), 21/7/07. (5) v Kilmarnock (Pre-season friendly), 24/7/07. (6) v Motherwell (Pre-season friendly), 28/7/07. 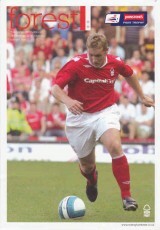 (7) v Notts County (Pre-season friendly), 30/7/07. 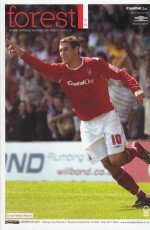 (8) v Derby County (Inaugural Brian Clough Trophy), 31/7/07. (9) v Sheffield United (Pre-season friendly), 4/8/07. (10) v Chester City (Carling Cup 1), 14/8/07. (11) v Swansea City, 18/8/07. (12) v Bristol Rovers, 1/9/07. (13) v Port Vale, 15/9/07. 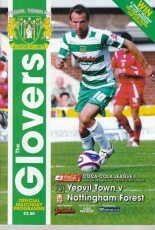 (14) v Yeovil Town, 29/9/07. (15) v Huddersfield Town, 2/10/07. (16) v Cheltenham Town, 13/10/07. (17) v Luton Town, 27/10/07. (18) v Lincoln City (FA Cup 1), 10/11/07. (20) v Brighton & Hove Albion, 7/12/07. (21) v Luton Town (FA Cup 2), 11/12/07. (22) v Oldham Athletic, 26/12/07. (24) v Swindon Town, 19/1/08. 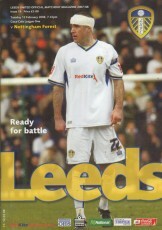 (27) v Leeds United, 12/2/08. (28) v Carlisle United, 19/2/08 – postponed. (29) v Leyton Orient, 23/2/08. (30) v Crewe Alexandra, 8/3/08. (31) v Southend United, 11/3/08. (32) v Northampton Town, 21/3/08. (33) v Doncaster Rovers, 28/3/08. (34) v Carlisle United, 1/4/08. (35) v Tranmere Rovers, 12/4/08. (36) v Hartlepool United, 26/4/08.